One of my favorite parts of attending a top tournament like Nationals or the US Open is the chance to discover some of the cutting-edge trends in the game. Like Roger Bannister and the 4 minute mile, the trickle-down effect is amazing when top players prove that something is possible. Once we see someone do something, then other players discover that they can do it, too, and suddenly, it’s a new standard in the game. I wasn’t in the game before dinking was “discovered” but I imagine it followed a similar pattern. I HAVE been in the game since “the Erne shot” and around-the-pole shots have become popular. They used to be few and far between, but now they are almost standard shots any 4.5+ player must be prepared to receive, if not be able to execute. One shot that I saw implemented more frequently at Nationals this year than in the past, is the third shot drive instead of the third shot drop. Today I want to talk about WHY top players are using the third shot drive instead of the third shot drop, WHEN it makes sense to use it, and how to tell whether it’s something that you should consider implementing in your game. Now, if you’ve been following me for any length of time, you may already know my take on the drop shot. If you don’t, you might consider checking out my posts on the Top 3 Reasons You MUST Play at The No-Volley Line (And 2 Lies You Tell Yourself When You’re There) as well as 4 Secrets to Get Your Dropshot to Go Where You Want (and Not Where You Don’t) and What to Do When Your Drop Shot Doesn’t Drop. It’s never good to be too predictable. At beginner and intermediate levels consistency is generally more important than variability. At the top levels, consistency is a given, and you want to keep your opponents on their toes. So it’s good to shake things up now and again, but ONLY, if you have something else to gain by mixing it up. I never recommend mixing it up just for the sake of mixing it up. In the case of the third shot drive, here’s the ideal scenario: Your opponents are caught off guard and inadvertently pop the ball up, giving your partner a chance to put the ball away. At the very least, your opponents will be on the defense and in the best case, the put-away will end the point in your favor. Remember, like I talk about in this article, whichever team is in a position to hit DOWNWARD on the ball has a better chance of winning the point. Conversely, whichever team is hitting the ball UPWARD has a better chance of losing the point. The drop shot is ONE way to get your opponents to hit the ball upward, and as another alternative, the third shot drive is simply a set-up shot for hitting the NEXT shot at a sharp downward angle. So if hitting a third shot drive is such a good alternative to the third shot drop, why don’t I recommend it to my students? While the third shot drive CAN be a substitute for the third shot drop, the drive, in general, is NOT a substitute for the drop shot. Players who opt for the third shot drive and DON’T end the point, will end up going back to the drop shot for the 5th, 7th and/or 9th shots of the game. They’ll do this in order to get themselves off the defense, back up to the net, and in a position to win. The well-executed drop shot is the fail-proof way to buy yourself time and keep your opponents from being too aggressive while you work your way up to the net. The drive will never buy you time to move up, which is why it will never be a full substitute for the drop shot. Now, let’s talk about WHEN it makes sense to go for the third shot drive, and when it DOESN’T make sense. First of all, teams who use this technique well are generally athletic, quick on their feet, and have quick reflexes. If your PARTNER is not athletic, quick on their feet, with quick reflexes, and a good understanding of the strategy behind the third shot drive, then you should NOT use the third shot drive. The third shot drive attack ONLY works if your partner moves to the net quickly and is prepared to put the ball away (if it’s high), or hit a drop volley back (if it’s low). If your partner is not able to control the ball well, then chances are the plan will backfire as your partner pops the ball up and your opponents (who are already up at the net) put it away for the win. So don’t hit a third shot drive if your partner isn’t very quick with excellent ball control. Chances are that the third shot drive is NOT a good strategy to implement into your game. Then give it a try once in a while to shake things up and let me know how it goes. In the meantime, if you have any further questions or comments, go ahead and post a comment down below. If you aren’t subscribed to Pickleball Channel, do it ASAP! Pickleball Channel produces TONS of great video content featuring top players, coaches and thought leaders in the sport of pickleball. 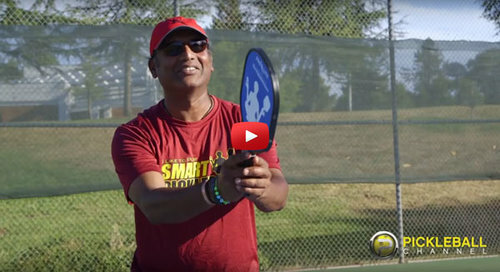 They produce plenty of more in-depth content but one of my favorite things they do is called “Pickleball 411” where they give you some great pickleball advice wrapped up in just a few short minutes.